^ Philpot, Robert "'Idol' announces 3rd semifinalist from Tarrant County", 'Star Telegram', February 18, 2010. ^ a b "Alex Lambert: 'People are going to like my style of music'", 'USA Today', February 24, 2010. ^ a b c d Philpot, Robert "'Idol' singers agree that Mom knows best", 'Star Telegram', February 24, 2010. ^ "Richland Rebels High School Football Alex Lambert Profile", 'MaxPreps', Fall 2008-2009. ^ a b “Meet golden ticket recipients Alex Lambert and Michael Castro”[リンク切れ], ‘The York Dispatch’, February 2, 2010. ^ "Michael Checks in with Alex Lambert"[リンク切れ], 'Hulu'. ^ a b Reiter, Amy "Alex Lambert's post-'Idol' appearance on 'Ellen'"[リンク切れ], 'Los Angeles Times', March 17, 2010. ^ "Alex Lambert: 'I probably won't be able to look at a banana the same'", 'USA Today', March 12, 2010. ^ Harper, Rebecca "Exclusive Interview: Alex Lambert", 'Hulu Blog', April 1st, 2010. ^ a b "Alex Lambert on Ellen", 'USA Today', March 17, 2010. ^ "Audition Cities & Hollywood: Dallas"[リンク切れ], 'AmericanIdol.com'. ^ Kaufman, Gil "'American Idol' Thins The Herd On Group Day", MTV News, February 10, 2010. ^ Byrne, Katie "'American Idol' Reveals Final Top 24 Contestants", MTV News, February 17, 2010. ^ Halperin, Shirley "Your Season 9 Top 24! "[リンク切れ], 'Los Angeles Times', February 17, 2010. ^ Kaufman, Gil "'American Idol' Top 12 Men Have A Rocky Live Debut", MTV News, February 24, 2010. ^ Ditzian, Eric "'American Idol' Top 12 Men's Report Card", MTV News, February 25, 2010. ^ Martin, Lara "'American Idol' Top 12 Boys Perform recap", 'Digital Spy', February 25, 2010. ^ Kaufman, Gil "'American Idol' Boots Tyler Grady, Janell Wheeler, Ashley Rodriguez, Joe Munoz", MTV News, February 25, 2010. ^ Slezak, Michael "'American Idol' Power List: We're down to 20! Who's your favorite? ", 'Entertainment Weekly', March 2, 2010. ^ Kaufman, Gil "'American Idol' Top 10 Men Step It Up", MTV News, March 2, 2010. ^ Ditzian, Eric "'American Idol' Top 10 Men's Report Card", MTV News, March 3, 2010. ^ Martin, Lara "'American Idol' Top 10 Boys Perform recap", 'Digital Spy', March 3, 2010. ^ Cantiello, Jim "'American Idol' In 60 Seconds: Alex Lambert, Crystal Bowersox Dominate Top 20", MTV News, March 5, 2010. ^ Slezak, Michael "'American Idol' semifinals (Top 8 guys): Who rocked? Who tanked? ", 'Entertainment Weekly', March 10, 2010. ^ Kaufman, Gil "'American Idol' Gets A Boost From Tim Urban, Michael Lynche", MTV News, March 10, 2010. ^ Ditzian, Eric "'American Idol' Report Card: How Did The Men Do? ", MTV News, March 11, 2010. ^ Martin, Lara "'American Idol' Top 8 Boys Perform recap", 'Digital Spy', March 11, 2010. ^ Kaufman, Gil "'American Idol' Shocker: Lilly Scott, Alex Lambert, Katelyn Epperly, Todrick Hall Exit", MTV News, March 11, 2010. ^ Slezak, Michael "'American Idol' names its season 9 Top 12: Did voters get it right? ", 'Entertainment Weekly', March 11, 2010. ^ Kaufman, Gil "'American Idol' Eliminations Shock And Disappoint Fans", MTV News, March 12, 2010. ^ Byrne, Katie "Alex Lambert Says 'American Idol' Stage Fright Was 'All In My Head'", MTV News, March 12, 2010. ^ Montgomery, James "Alex Lambert, Lilly Scott Join 'American Idol' Most Shocking Eliminations", MTV News, March 12, 2010. ^ Halperin, Shirley "The ultimate 'American Idol' power ranking"[リンク切れ], 'Los Angeles Times', May 31, 2010. ^ "'American Idol' Cast-Off Alex Lambert Visits Ellen", 'The Ellen Degeneres Show', March 17, 2010. ^ Ram, Archana "'Idol' exit Q&A: Alex Lambert on stage fright and the song he wish he sang", 'Entertainment Weekly', March 12, 2010. ^ Stransky, Tanner "'American Idol' alum Alex Lambert sings 'Let Me Love You' on Ellen: What could have been! ", 'Entertainment Weekly', March 17, 2010. ^ "Four more for Friday: Alex Lambert, Crystal Bowersox, Lee DeWyze, more", 'USA Today', March 19, 2010. ^ "Alex Lambert on 'Good Day Texas'", 'USA Today', March 24, 2010. ^ "Bring Alex Lambert BACK on American Idol", 'Change.org'. ^ Kaufman, Gil "Alex Lambert Petition Demands His Return To 'American Idol'", MTV News, March 15, 2010. ^ Robertson, Cheri "Monday's 'American Idol' news: Alex outrage, dreads and Dreamgirls"[リンク切れ], 'The Seattle Times', March 15, 2010. ^ Reiter, Amy "Will Alex Lambert return by popular demand? "[リンク切れ], 'Los Angeles Times', March 16, 2010. ^ "American idol 2010: Demi Moore supports petition for Alex Lambert’s return", 'Unreality TV', March 15, 2010. ^ Halperin, Shirley "Alex Lambert fan campaign shifts gears, sets sights on 'If I Can Dream'"[リンク切れ], 'Los Angeles Times', March 29, 2010. ^ Halperin, Shirley "Alex Lambert joins 'If I Can Dream' cast, loses mullet"[リンク切れ], 'Los Angeles Times', March 30, 2010. ^ Herndon, Jessica "Idol Cast-Off Alex Lambert Nabs Web Series", 'People', March 30, 2010. ^ Kaufman, Gil "'American Idol' Castoff Alex Lambert To Join 'If I Can Dream'", MTV News, March 31, 2010. ^ Slezak, Michael "Alex Lambert joins 'If I Can Dream'...will American Idol's loss be Web series' gain? ", 'Entertainment Weekly', March 31, 2010. ^ "Alex Lambert joining 'If I Can Dream' cast", 'USA Today', March 31, 2010. ^ Halperin, Shirley "It's moving day for Alex Lambert! "[リンク切れ], 'Los Angeles Times', April 1, 2010. ^ Gonzalez, Sandra "'American Idol' castoff Alex Lambert: 'If I Can Dream' will show people 'the real me'", 'Entertainment Weekly', April 2, 2010. ^ Halperin, Shirley "Alex Lambert's shock and awe at post-'Idol' 'Dream': 'I felt like I actually had a chance'"[リンク切れ], 'Los Angeles Times', April 2, 2010. ^ Martin, Lara "'Idol' star Lambert enters 'Dream' house", 'Digital Spy', April 2, 2010. ^ Martin, Lara "Alex Lambert ('If I Can Dream')", 'Digital Spy', July 27, 2010. ^ “Alex’s Track List, Alex-Lambert.com. ^ "Alex Lambert posts music on 'If I Can Dream' site", 'USA Today', July 16, 2010. ^ "New Alex Lambert Demo – Imperfectly Perfect", 'MJs Big Blog', July 16, 2010. ^ "Alex Lambert “Untouchable” – New Demo! ", 'MJs Big Blog', August 5, 2010. ^ Parker, Lyndsey "Living The Dream: Alex Lambert Records First Demos", 'Yahoo! Music', July 19, 2010. ^ "Alex Lambert Nabs Theme Song For If I Can Dream", 'MJs Big Blog', May 11, 2010. ^ a b "If I Can Dream Season One Announcement"[リンク切れ], If I Can Dream. ^ a b Longs, Herb "'If I Can Dream' Season 1 Abruptly Comes To An End"[リンク切れ], 'AINow', October 5, 2010. ^ Longs, Herb "Bits & Pieces: October 28, 2010"[リンク切れ], 'AINow', October 28, 2010. ^ "Clear Channel Radio Creates Music Video for Rising Star Alex Lambert"[リンク切れ], 'MarketWatch', July 26, 2010. ^ "Alex Lambert video debuts on iheartradio", 'iheartradio', July 26, 2010. ^ Parker, Lyndsey "Alex Lambert Beats DeWyze & Bowersox To The Punch With First Season 9 'Idol' Music Video", 'Yahoo! Music', July 26, 2010. ^ "Alex Lambert's 'I Didn't Know' video", 'USA Today', July 27, 2010. ^ "Alex Lambert – “I Didn’t Know” – Video Premiere! ", 'MJs Big Blog', July 27, 2010. ^ "15th Annual Webby Awards Official Honoree Selections"[リンク切れ], 'The Webby Awards', April 12, 2011. ^ Halperin, Shirley "Backstage with Alex Lambert"[リンク切れ], 'Los Angeles Times', May 21, 2010. ^ Longs, Herb "Alex Lambert Performs At 2010 US Open Of Surfing"[リンク切れ], 'AINow', August 26, 2010. ^ "Alex Lambert – US Open of Surfing – Huntington Beach CA", 'MJs Big Blog', August 27, 2010. ^ "Saturday, Aug. 28 Street Fest Schedule", 'Sunset Strip Music Festival'. ^ "Alex Lambert Performs at the Roxy", 'Celebuzz', September 9, 2010. 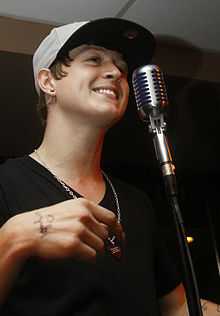 ^ "Alex Lambert continues to wow fans during live shows"[リンク切れ], 'Idol Stages', September 1, 2010. ^ "EXCLUSIVE: Who Does Alex Lambert Want to Replace Simon Cowell!? ", 'Hollywire', May 17, 2010. ^ "Dodgers return home to take on Diamondbacks, Braves, Cardinals and Angels", 'MLB.com Press Release', May 28, 2010. ^ "Alex Lambert – God Bless America – L.A. Dodgers"[リンク切れ], 'TV.com', June 9, 2010. ^ "Alex Lambert Sings God Bless America, Dodger Stadium, Los Angeles", 'MJs Big Blog', June 9, 2010. ^ "Alex Lambert to Perform at Elvis on Tour Pre-Event Party"[リンク切れ], 'Elvis Week Press Release', August 11, 2010. ^ "Alex Lambert Visits Children's Hospital LA With Reality Cares", 'Look to the Stars', August 9, 2010. ^ "Alex Lambert Performs At Childrens Hospital, Los Angeles", 'MJs Big Blog', August 6, 2010. ^ "Alex Lambert: If I Can Dream For Charity", 'Look to the Stars', August 31, 2010. ^ Thibault, Robin "Alex Lambert Performs In Fort Worth, TX"[リンク切れ], 'AINow', October 25, 2010. ^ "Alex Lambert Performs Fort Worth Breast Cancer Awareness Benefit", MJs Big Blog, October 25, 2010. ^ "Your Random Weekend Memo", 'USA Today', October 8, 2010. ^ Parker, Lyndsey "Alex Lambert Forgets The Lyrics (But Not His Swagga) On 'Don't Forget The Lyrics'", 'Yahoo! Music', November 3, 2010. ^ "Alex Lambert on ‘Don’t Forget the Lyrics’", 'MJs Big Blog', November 3, 2010. ^ "Star-studded Stickam Live For Japan webathon May 27"[リンク切れ], 'Stickam Blog', May 20, 2011. ^ Avina, Alex "Stickam For Japan benefit @ The Roxy 5/27/11", 'Social Music Today', June 4, 2011. ^ "Alex Lambert At Stickam Live For Japan", 'World News', May 28, 2011. ^ "Alex Lambert live in New York City – Video", 'Rickey', June 29, 2011. ^ "Alex Lambert Performs at Private Event in NYC"[リンク切れ], 'AINow', June 29, 2011.